The travelers shouted, “Let him burn!” as one of the flaming terrorists tried to flee from the scene of the blast. 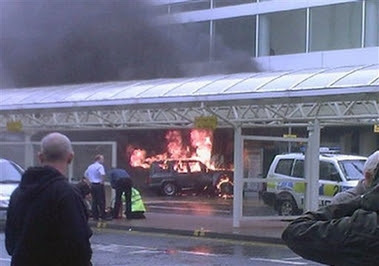 A car blasted through security and rammed the Glasgow Airport before bursting into flames today. Two Asian men were arrested. Detectives hunted Saturday for suspects who abandoned two explosives-packed cars in the heart of London’s nightlife district, reviewing closed circuit television footage and scouring the vehicles for clues. Amid fears of further attacks, a burning sport utility vehicle crashed at full speed into the terminal building at Glasgow airport in Scotland, police and witnesses said. The airport was evacuated and all flights suspended. TV footage showed flames and black smoke rising from a vehicle in front of the building. Earlier Saturday, counterterrorism officers at Scotland Yard briefed Prime Minister Gordon Brown, and the British leader later chaired a meeting of top spies, police and senior officials in COBRA, the government’s emergency committee, his office said. Detectives said they were keeping an open mind about the suspects in the London case, but terrorism experts said the signs pointed to a cell linked to or inspired by al-Qaida. Police would not comment on an ABC News report saying police had a “crystal clear” picture of one suspect from CCTV footage. Police said they were strengthening patrols in the city to reassure the public, with 350 officers on duty at the annual Gay Pride parade through central London, not far from where two Mercedes loaded with gasoline, gas canisters and nails were found Friday. 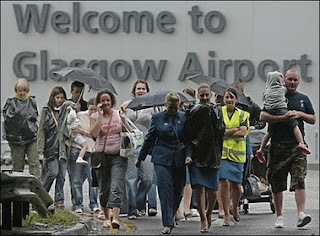 Today is a very busy travel day in Great Britain as children are out for vacation. The airport travelers knocked the suspects to the ground as they tried to flee the burning jeep. One eyewitness, who knocked the terrorist suspect over with his forearm said: “The man was wrestling with police on the ground. “I had seen him and the other man get out of the car. The flames were burning through his clothes. Police were telling everybody to get back. The pair were held down before police led them away. Pajamas Media has a roundup on the blast and reports that three were arrested. Dan Riehl notes that the burning man look very composed as he was led away by police. Jammie Wearing Fool as an amazing shot. Don Surber reports that the Queen did her part. Jules Crittenden is updating his Londonistan roundup.